We are very excited to announce the opening of two new outdoor heated swimming pools in 2018. 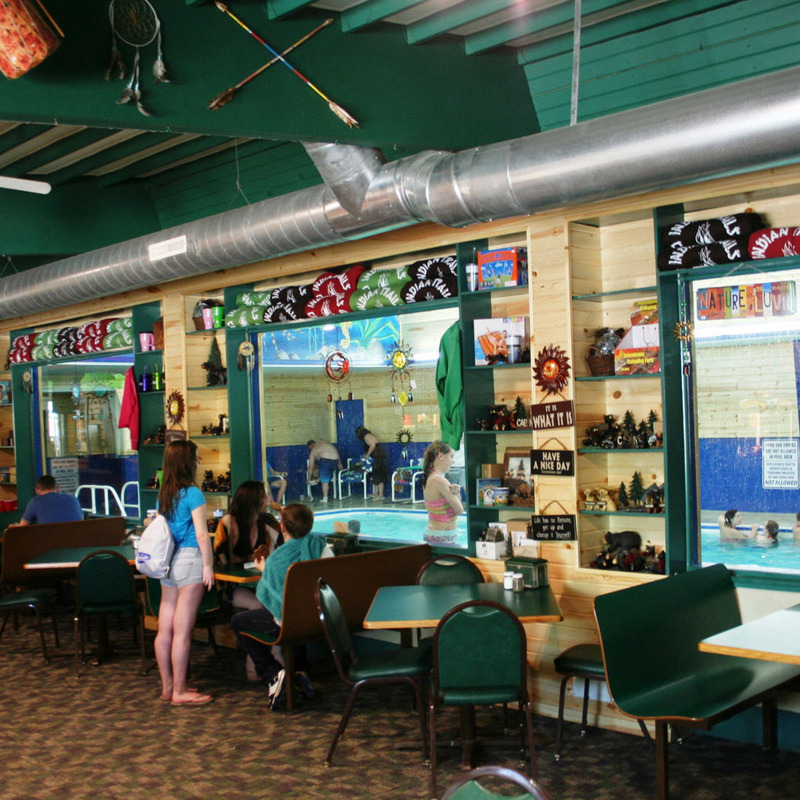 The pools are located next to a brand new log building which has bathrooms, showers, changing rooms and a snack bar. It also has a state-of-the-art Ultraviolet (UV) sterilization system which means the best water quality, clarity, and healthy swimming environment for your family. An ADA lift is also available. Spring and fall camping is better with an indoor pool when it’s too cold to swim outside in the pond or in the outdoor pools. The indoor swimming pool has separate bathrooms and locker rooms for changing and showering before entering the pool. 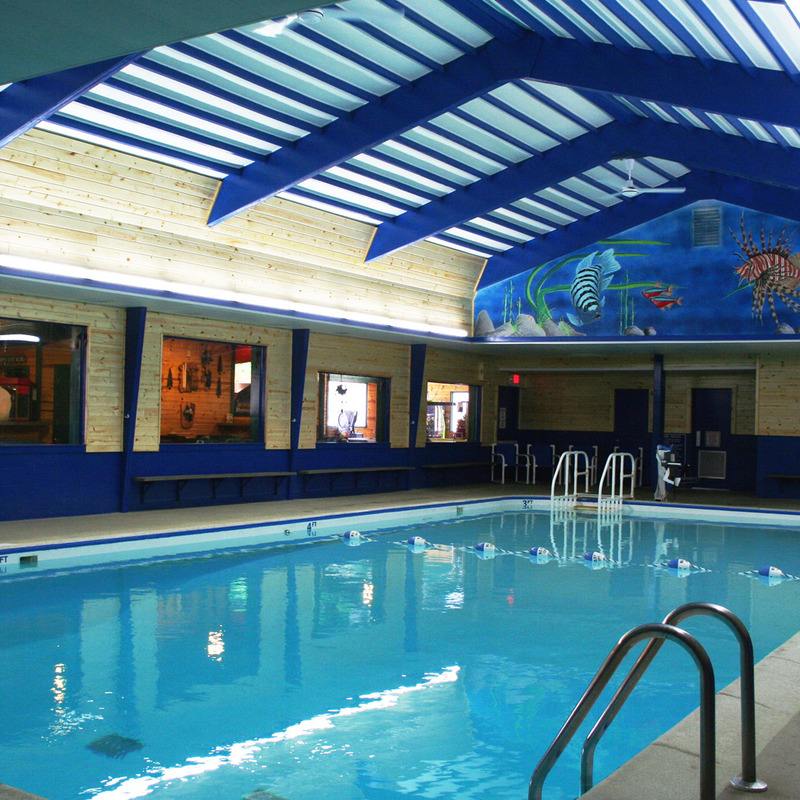 It also has a state-of-the-art Ultraviolet (UV) sterilization system which means the best water quality, clarity, and healthy swimming environment for your family. An ADA lift is also available. 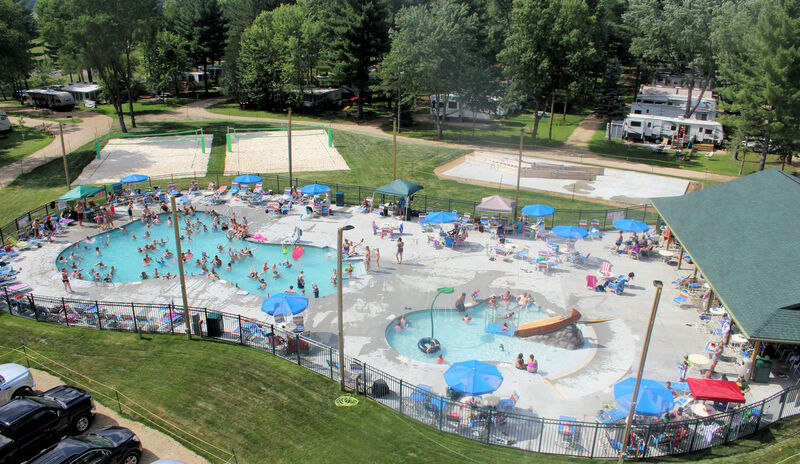 The pool opens at 9:00 a.m. with adult swim from 9:00 a.m. to 10:00 a.m. Open swim for kids starts at 10:00 a.m. and closes 30 minutes prior to the store closing. 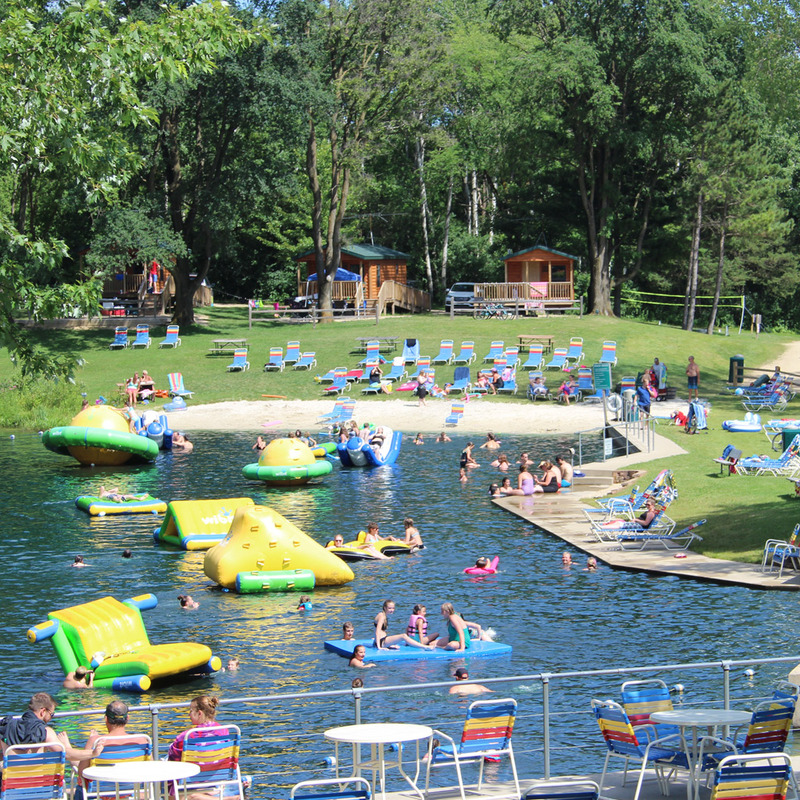 The swimming pond features two beaches and is full of fun inflatable toys. A shallow area with small inflatables is designated for younger kids. 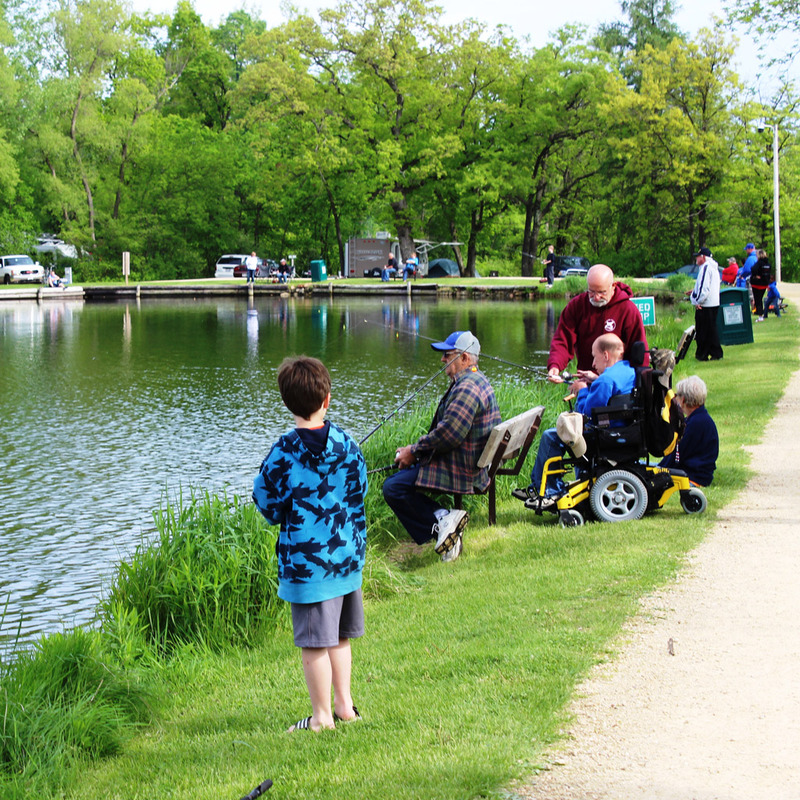 The fishing lake is stocked with bluegills, bass, crappie, and perch. Rent a row boat, canoe or kayak and get out to the hot fishing spots or just enjoy a relaxing day on the lake. Kids of all ages love the turns, rollers, dips, bumps, and drops of the BMX Track. Helmets are required for the BMX track and are available for rent at the camp office for $1 per day. 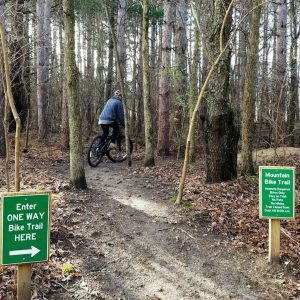 Check out the new Single Track Mountain Bike Trail. The entrance is on the way to the two Bark Parks and BMX track. 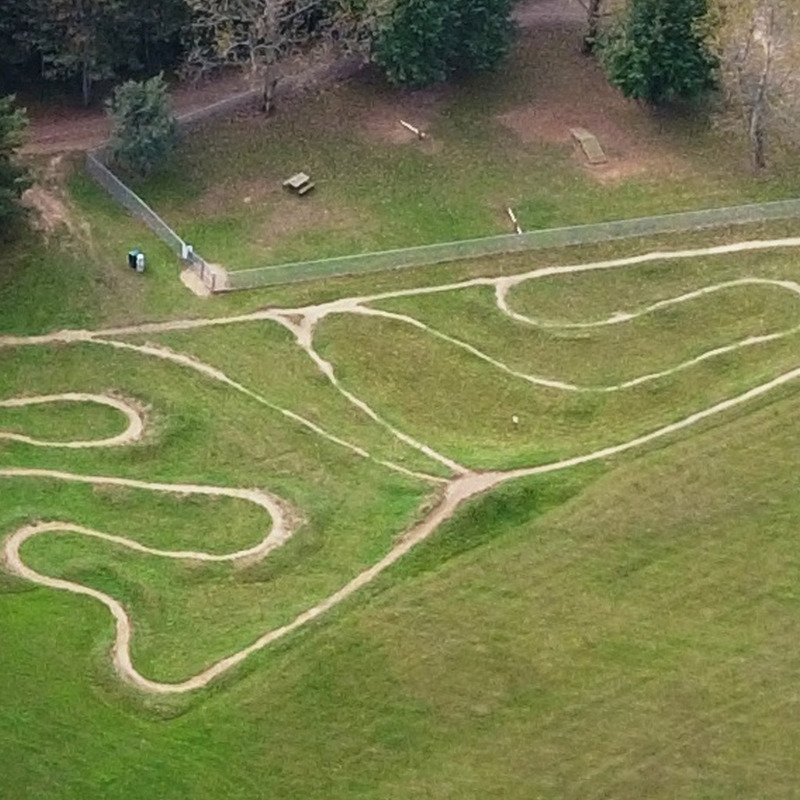 This half-mile trail has plenty of turns, rollers, dips and drops. Helmets are required for the mountain bike trail and are available for rent at the camp office for $1 per day. 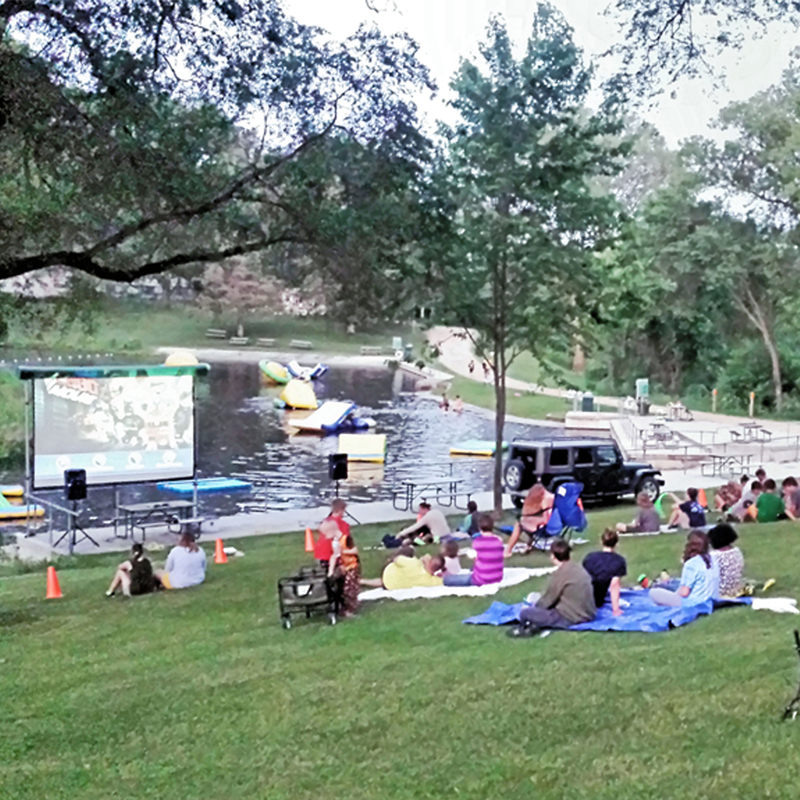 Watch a movie under the stars (weather permitting) or in the waterwheel shed. Occasionally we will be showing movies starting at dusk. Check your weekend activity schedule for details. Bring your blanket and sit on the hill over-looking the swimming pond and view the movie on the large screen. Our natural outdoor amphitheater is a perfect way to watch a movie and you’ll love the outdoor sound system. Popcorn, candy and drinks are available at the store and snack bar. In 2008 Indian Trails adopted the 357 acre Waterfowl Production Area (WPA) in collaboration with the US Fish and Wildlife Service. While a WPA is managed primarily for ducks and geese, it also provides habitat for a variety of other wildlife species such as non-game grassland birds, shorebirds, wading birds, mink, muskrat, wild turkey and deer. Trailhead parking areas are located across from the campground on Haynes Road. Trails are for foot traffic only. Bicycles are not allowed. 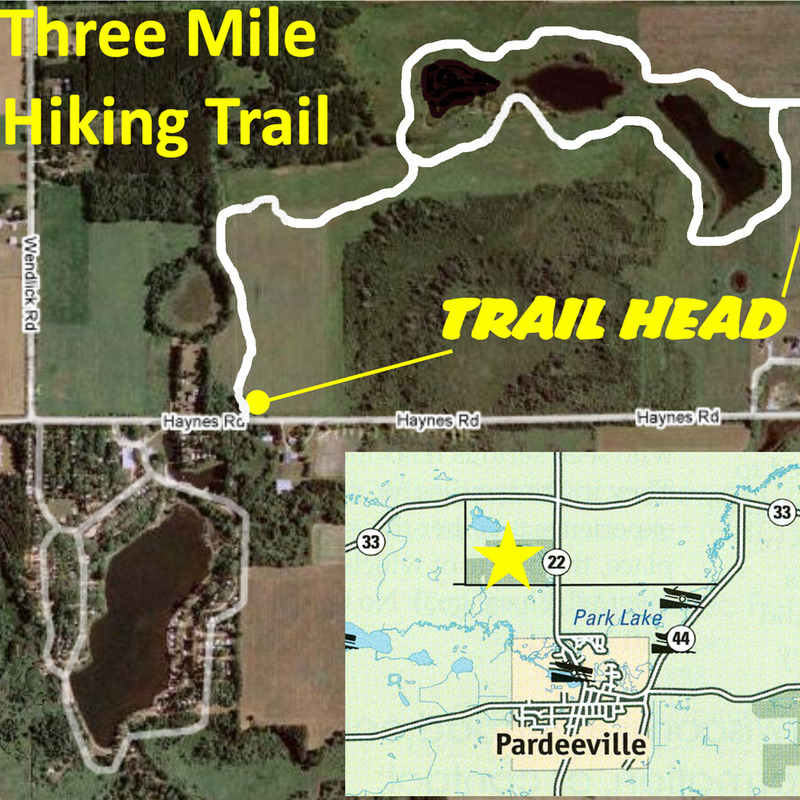 Indian Trails developed the three mile trail system and maintains the trails and trailhead parking areas. The WPA is open to wildlife observation, hiking, cross-country skiing, nature study and photography. Dogs must be on a leash except while engaged in hunting during established open seasons. We are pleased to offer delicious Indian Trails Custom Topping Pizza in sizes 9”, 12” and 16”. Choose from 10 different toppings to create pizza the way you like it. Friday Night Fish Fry is offered from Mother’s Day to Labor Day that includes deep-fried battered cod or perch, french-fries, salad bar, dinner roll and a beverage. Homemade Sunday Morning Donuts by Tiffany can be enjoyed from Mother’s Day to Labor Day and on the Halloween weekends. Enjoy Angus burgers, chicken sandwiches, salads, fries, appetizers, and the bottomless cup of coffee. We also offer hot chocolate, cappuccino or tea. Grab a soft pretzel, fresh popped popcorn or nachos for an on-the-go snack. Soft Serve Ice Cream & Flavor Burst: Choose from chocolate, vanilla, twist, or make your own flavor by combining from 8 different Flavor Burst cone flavors. Try other yummy soft serve delights like shakes, malts, sundaes, banana splits, root beer floats, and razzles. We offer a wide variety of crafts so you are able to find a special gift for that hard to shop for person. 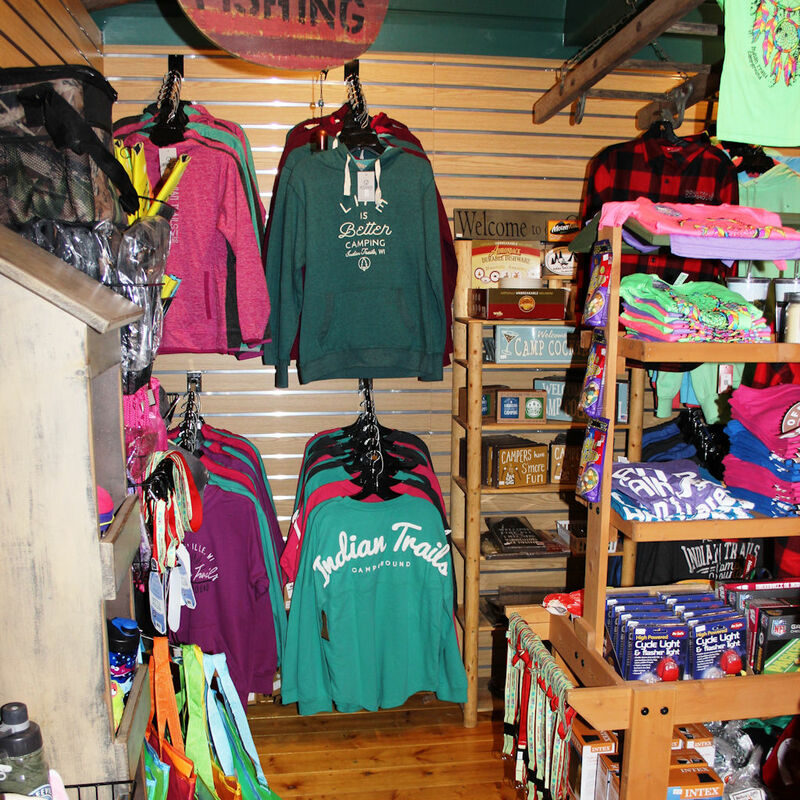 We have a large selection of shirts, sweatshirts and hats for you to remember your vacation by. 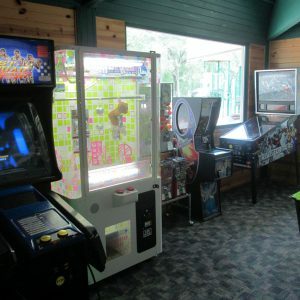 We have a general store with basic grocery items and amenities that you may have forgotten at home or just didn’t want to pack to bring along. Our craft cabin has items such as candles, plaques, lodge crafts, Packer merchandise, books and much more. We have a kid section with TY stuffed animals, small toys and games and the famous candy counter has a selection big enough to please any sweet tooth craving. For kids of all ages. Yes, adult kids too! Be sure to check out the calendar of events for a list of our fun-filled themed weekends with planned activities. 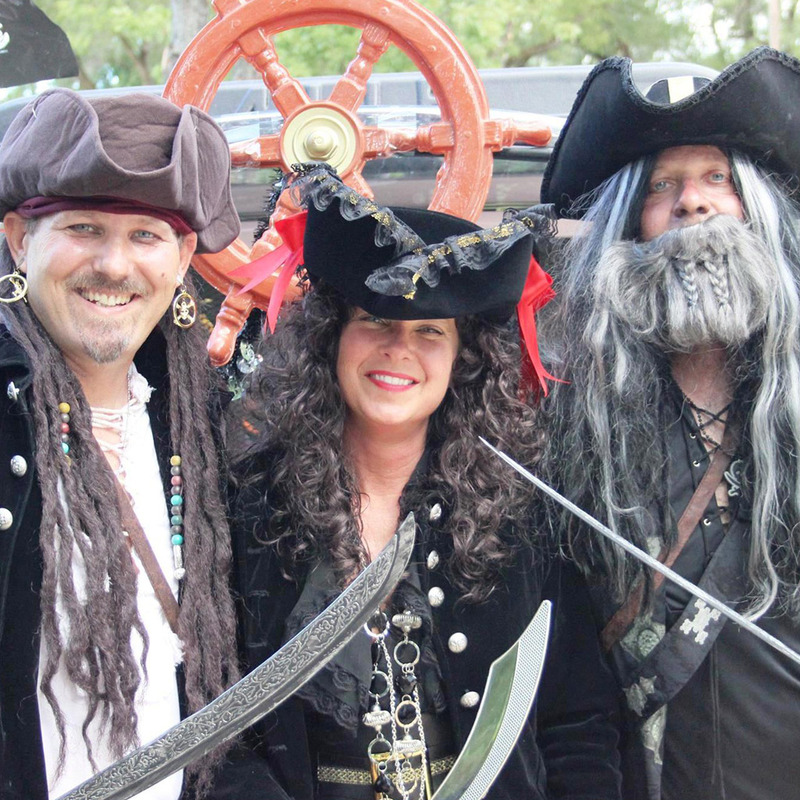 Some of our campers favorites include Pirate Weekend, Wild West Weekend, and the Halloween Weekends. Have a great time with family and friends in our sports & recreation areas. 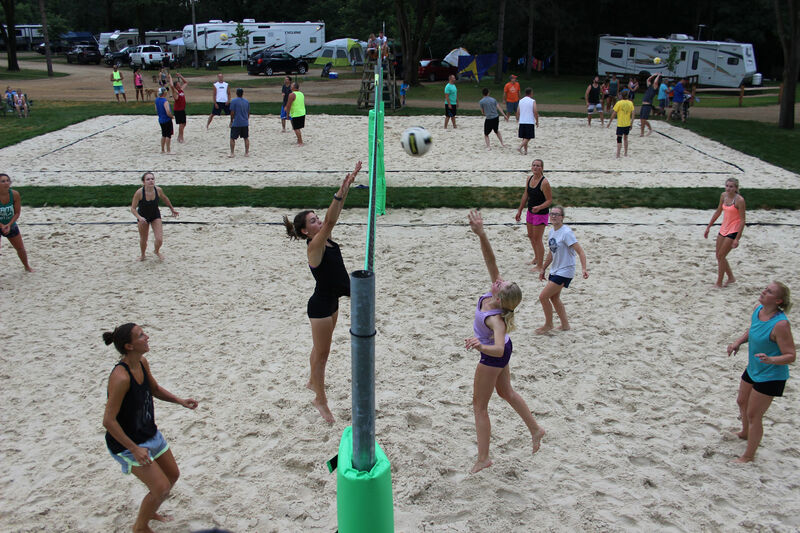 We have three new Volleyball Courts, a new larger Basketball Court, a new Baseball Diamond, Shuffle Board court, Bean bag toss court, GaGa Ball, and Horseshoe courts. Free to use, just check out the equipment at the store. 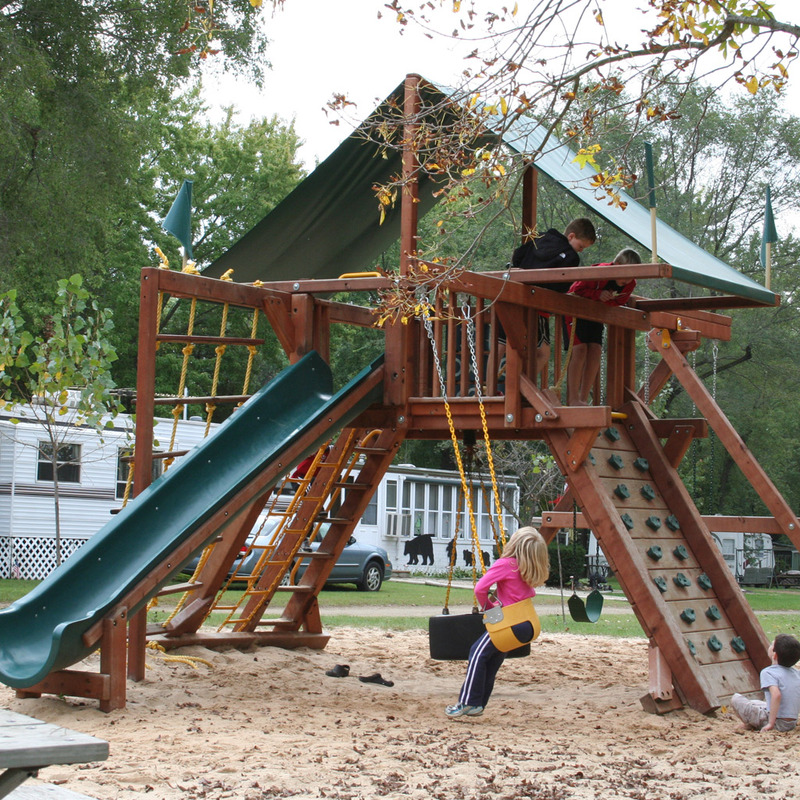 For the kids, we have four playgrounds throughout the campground to provide entertainment all day long a short distance from your site. Kids of all ages love the GaGa Ball Pit located by the Store. 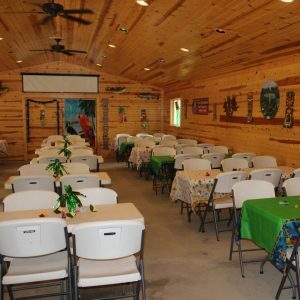 Rent a pavilion for your special events. Check out our newest pavilion located next to the new outdoor pool complex. Take your group for a relaxing paddling trip with Fox Trail Outfitters. 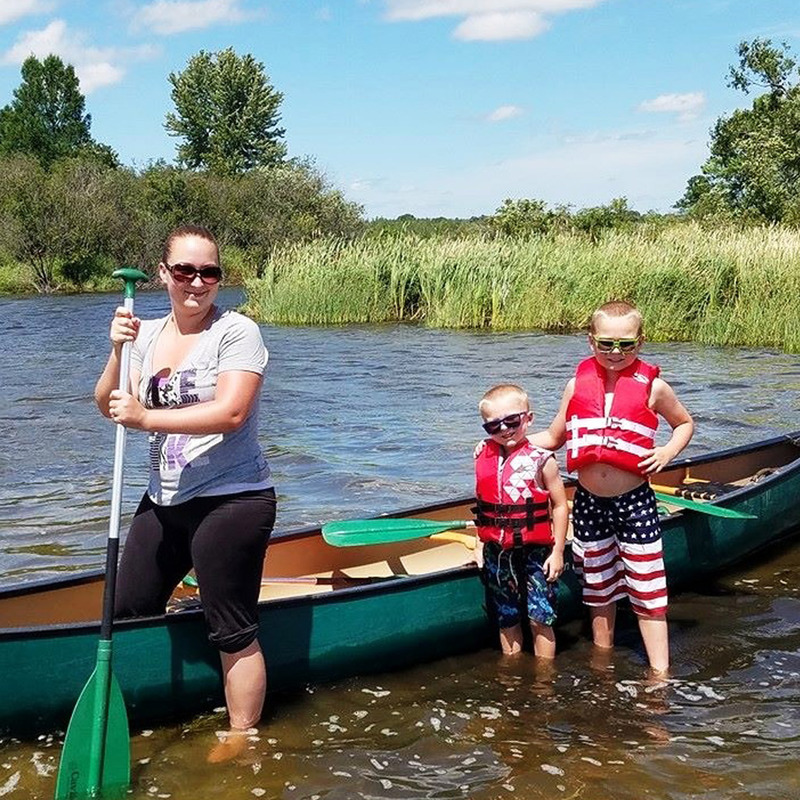 Canoe and kayak trips on the Historic Fox River are a great way to get “into the wild”. See our River Trips page for more information. 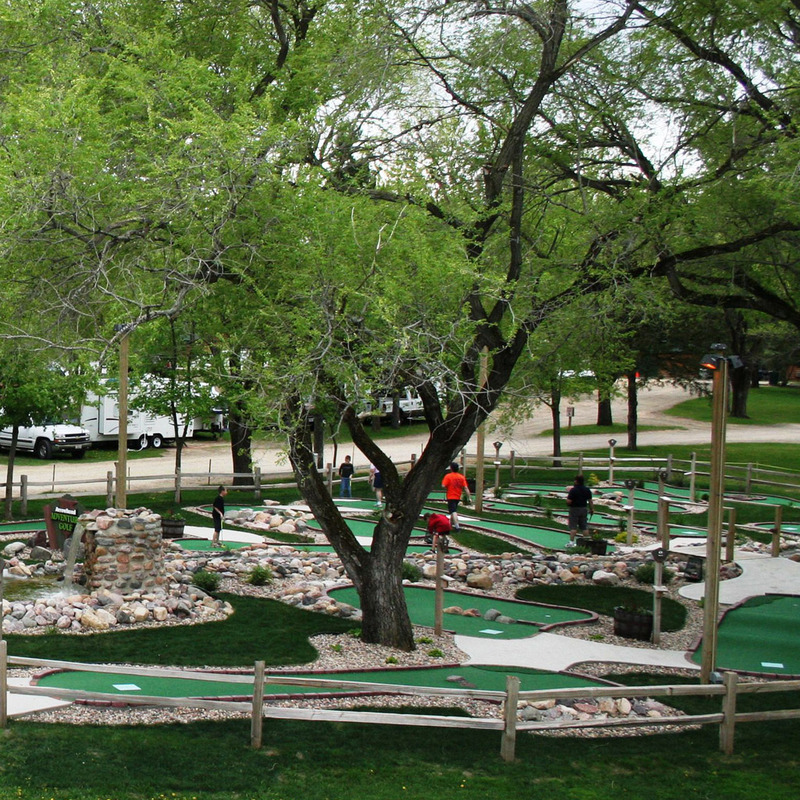 Arrowhead Adventure Mini Golf is designed for the whole family and is ADA accessible. See our Mini Golf page for more information. Have you ever seen a dog smile? If not, just watch one coming out of the bark park!! We are pleased to offer two bark parks for 2018. One for the little dogs and one for the big dogs. 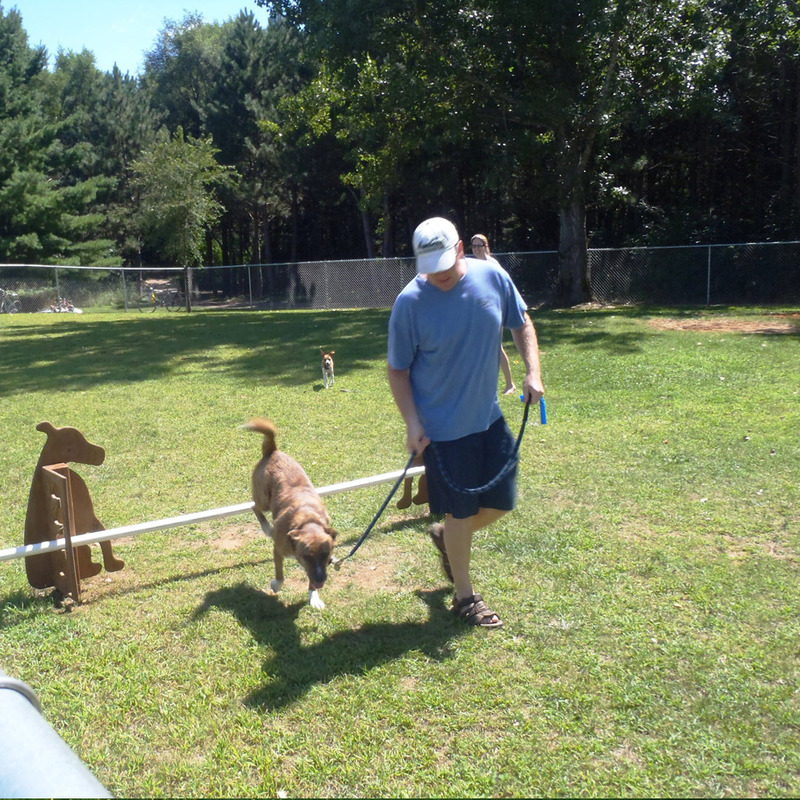 Each dog park features agility equipment for your pet. The bark parks are a great place to let your dog run off leash, as pets are required to be on a leash at all times in the rest of the campground. Pump out Service – Monday-Friday 9-3 only. Inquire at office for cost. Reserve Your Campsite or Cabin Today!